The day I realized my oldest child was truly gifted and not just a smart kid was one of my most poignant moments of regret as a parent. I have always tried to parent without regret. Of course moments come up. I wish I had been more patient. I wish I had focused less on my to do list the day before. Little mistakes come along. Most of the time, however, I have no major regrets. I parent very intentionally and don’t make major decisions lightly. This was a day of regret, however. My son was in the third grade. Eight years old. I had spent eight years of his life not addressing the fact that he was gifted. Sure, I always thought he was smart. I am an observant person, though, and it doesn’t take much observation to see that basically every parent out there, especially the first time parent, thinks their child is the best thing to ever walk on the earth. I knew I was super impressed with everything he did, but I also observed him daily from the moment he was born. To get to where he was from where he started was impressive. Sure, most babies learn to smile at some point, but when my baby did that for the first time, it was the most amazing smile ever shone! At least that was my opinion, and I knew every parent out there felt the same about their own babies. I thought he was smart. Of course I did. I am his mother. Why the regret when I found out he wasn’t just smart, but gifted? Because I didn’t push to have more of an idea of his level of intelligence. I didn’t educate myself on giftedness so I could help him navigate that world. It is learning your child has an aptitude for something and you haven’t done anything to help nourish that aptitude. And once I started learning more about giftedness, I realized there is not only the aptitude side, but with giftedness comes the weaknesses. Gifted children typically excel in areas and lack in others. So not only was I not nourishing the aptitude, I wasn’t taking into account the weaknesses and responding to those effectively. I will always be thankful to his third grade teacher who explicitly expressed to me how very gifted he was. She didn’t beat around the bush. She didn’t tone it down. She said it exactly like it was and made sure I grasped it. This post contains affiliate links. That is when I started researching how to parent a gifted child. A gifted child has unique needs. Just as a child in speech therapy needs specific education and help for that, a child who is gifted needs specific education and help. Most gifted children are out of sync in areas of life. “The more highly gifted the child, the more out of sync she is likely to be within herself, with wide difference between areas of strength and areas of relative weakness” (A Parent’s Guide to Gifted Children page 7). I don’t want other parents to face that feeling of regret. Whenever someone contacts me wondering if their child might be gifted, I encourage them to research it. I highly recommend the book A Parent’s Guide to Gifted Children. I realize the emotional risk here. I was there. I didn’t want to be in a place where I pressured my child to be gifted if he wasn’t. I didn’t want him to feel the pressure to be gifted. I wanted him to know I loved him for him. No pressure. But there is power in knowing! So it is worth researching. It is also hard with teachers at school. No one wants to come across as a crazy mom, so when a Kindergarten teacher told me how he is really quite smart, I just nodded. I didn’t ask more questions. He is my oldest and people didn’t know me. Teachers are hesitant to use the word gifted before age 8, typically. Before that, it is hard to tell if intelligence is because of nature or nurture. It truly is hard to tell. They don’t want to falsely label a child. There are some common characteristics of gifted children. Page 11 of A Parent’s Guide to Gifted Children is full of a long list of characteristics. Of course, gifted people are humans, which means there is a wide diversity among them. And many of the listed characteristics can definitely be the result of nurturing. Usual alertness as an infant? Sound like a common comment toward Babywise babies in general? Longer attention span? Sound like a common result of a child who does Independent Playtime consistently? 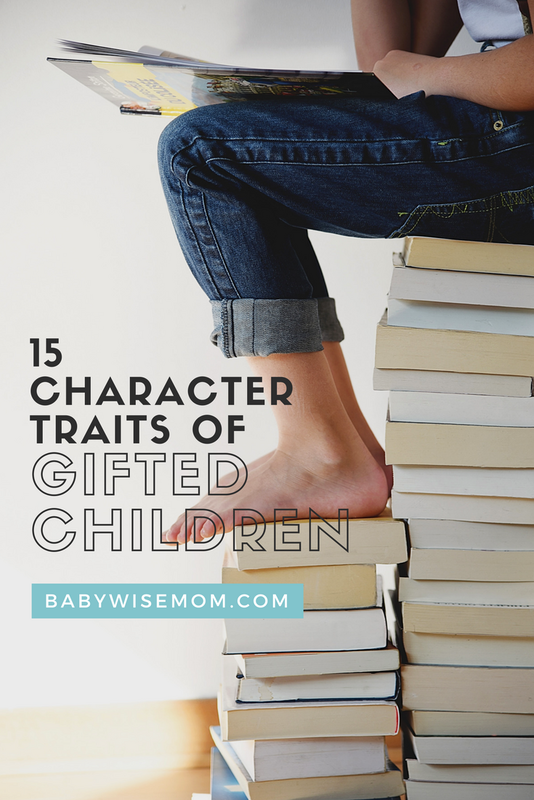 So it is tricky to look at the list and think, “My child is gifted!” without questioning some aspects. It is worth noting that my second child has also been identified as gifted. Once my oldest was, I knew she was also, especially when it came to the language side of life. With that said, I don’t know what will happen with my current seven year old. She won’t be identified now until she enters fourth grade due to the restructuring of the gifted program in our district. It is ironic that I hesitated to look into giftedness with my oldest because I didn’t wand him feeling pressure. Now I have two gifted children with two more to follow–talk about pressure on them! I don’t put it there, but I have no doubt it will be put there by themselves. 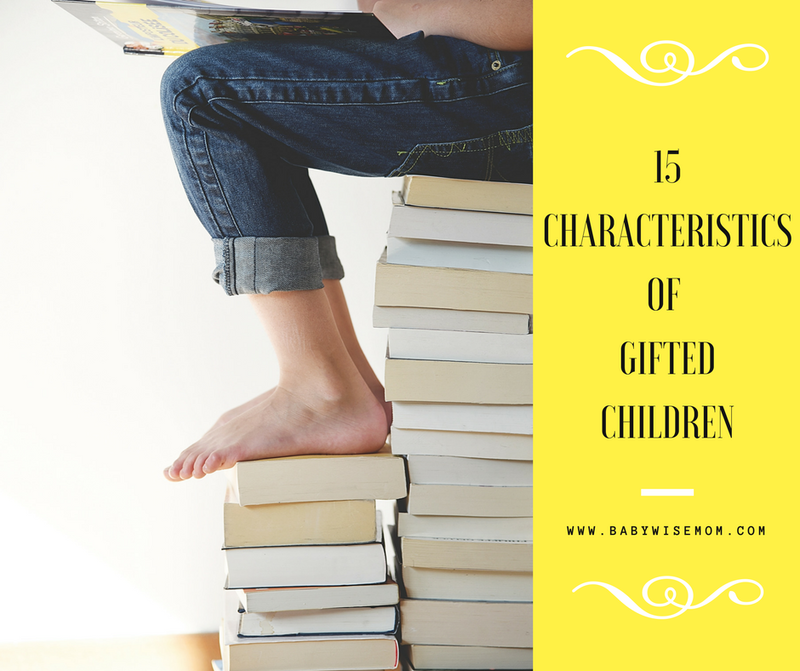 That brings us to the 15 most typical characteristics of gifted children. These characteristics can help you determine if your child might be gifted. These start on page 12 in the A Parent’s Guide to Gifted Children book. lead them to be early readers, and they often read extensively. Even before they can read, these children delight in (and insist upon being read to and are highly self-motivated to learn letters and numbers” (page 12-13). Here is the hard thing with this. I am one who speaks to my children like I speak to adults. I also read like crazy to my kids. These are things that will lead naturally to all of my kids, no matter what, having strong verbal abilities and loving books. Nature versus nurture can come up with every one of these. Usually good memory. They learn quickly and easily and will “quickly notice if you omit a word when you read a bedtime story.” Sometimes personality can come into this. Kaitlyn would never correct someone. She is too much of a peacemaker to tell the person reading the story they left a word out. Intense curiosity. Gifted children endlessly ask why. The hard thing with this one for me is, isn’t this every single toddler and preschooler out there?!? Wide range if interests. Some focus completely on one single interest (until they move on) while others move from interest to interest. Passionate imagination and creativity. Gifted children often have imaginary friends. “…as long as the child gives and receives affection, imaginary playmates simply reflect the child’s high intelligence, active imagination, and creativity” (page 14). Remarkable sense of humor. They delight in word play and silly one-liners. Impatience with others or with themselves. They are often impatient. Gifted people have always been gifted, so they don’t understand why others are not grasping concepts or moving through tasks as easily. I was labeled gifted as a child, and honestly, I was an adult before I really accepted that maybe people weren’t just playing dumb or being lazy when they didn’t get something. Gifted children can also be very impatient with themselves because they know what they want to accomplish, but can’t quite reach it yet. Longer attention span. “Persistence is a long-lasting trait of gifted children and adults” (page 16). Complex thinking. “The search for complexity leads them to become easily bored, particularly with routine tasks, and they may abandon tasks if they are too mundane” (page 16). Concern with social or political problems or injustices. Gifted children are rule followers and have concern for rules at a younger age than most children. They are also concerned about fairness. Sensitivity. “Professionals are beginning to recognize that the brighter the child, the more sensitive he may be” (page 17). They can be sensitive toward the feelings of others, sensitive to the expectations of others, and sensitive to conflict (peacemakers). They can have easily hurt feelings. They can also be sensitive to touch and smell. Intensity. Gifted children are more intense than most. They do things with intensity. They believe things with intensity. They state opinions with intensity. Daydreaming. They can get lost in their own thoughts and daydream. Many, if not all, of these traits can be used for benefits and can also be a hindrance. Strengths ad weaknesses. Daydreaming is a great skill for solving problems, but it can get a child in trouble in class if he isn’t paying attention. Playing one million questions a day can get old, quickly, but it helps a child learn a lot if an adult will answer those questions. If you are wondering if your child might be gifted and these 15 characteristics seem to describe your child, I highly recommend you read A Parent’s Guide to Gifted Children. It will help you get a better idea if your child is gifted and help you nourish both the strengths and the weaknesses of your child. You can know you did what you could to nourish, and you can move forward with one less regret. If you still are feeling unsure, be sure to read up on How To Tell the Difference Between Smart and Gifted.